On March 16, 2018, we held our BMI Award Ceremony at the Atrium of the Roger-Guindon Hall where 5 awards were presented to recognize the exceptional work of some of our members. Dr. Daniel Figeys, Chair of the Department, presented these awards which have been designed to reward recent success and innovation by faculty and students. This year’s recipient is Sarwat Khan. Sarwat has been pursuing his MSc degree with Dr. Rebecca Auer since 2016. He has successfully generated a wealth of data which has been published in several journal articles. Of note, he is a first author on two research articles and a second author on another. Not only has he published well, he has made major contributions toward a therapy that is being considered for clinical trials. Apart from that, he has attended and presented at many conferences and has been the recipient of several awards including an OGS scholarship and an Award of Excellence. In addition, he has exemplified great leadership and is very much involved in the community. This year’s recipient is Tyler Renner. 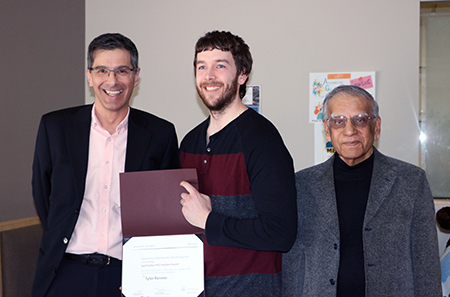 Tyler Renner is awarded the Syed Sattar PhD award for his research in Dr. Marc André Langlois’s laboratory developing cutting edge flow cytometry approaches to analyze viruses (HIV-1, MLV and Vaccinia virus) and extracellular vesicles at the single particle level. Tyler is recognized for his outstanding productivity: he is first author on two papers published in the Journal of Virology, and co-first on a paper in Scientific Reports, he has two co-author articles in the journals Vaccine and Virology, and is first-author on a manuscript currently under review in Retrovirology. 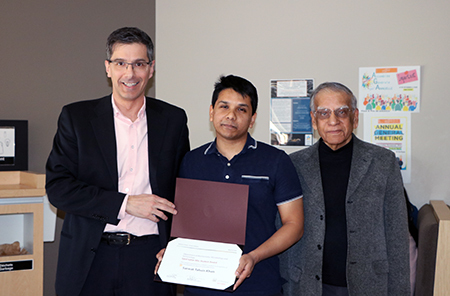 His technological innovation is also recognized with a 1st place research award at the Canadian Cytometry and Microscopy Association (CCMA) meeting. This year’s recipient is Marie-Claude Bourgeois-Daigneault. Dr. Bourgeois-Daigneault has been a post doc in Dr. John Bell’s lab since 2013 where she works on cancer immunotherapy and oncolytic virotherapy. Her track record of achievements is simply outstanding. She is an author on 13 publications, 6 of which are as senior/corresponding author. The impact of her research is clearly demonstrated through her most recent publication in Science Translational Medicine, where it garnered international recognition through editorials in Nature Reviews Drug Discoveries and Nature Reviews Clinical Oncology, and press coverage in news sources like The Scientist, Daily Mirror UK, the Ottawa Citizen and CTV Ottawa live. 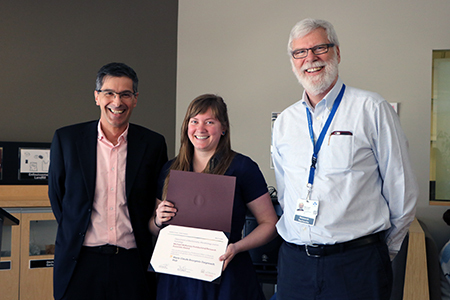 She has also received several awards during her postdoc including the CIHR postdoctoral fellowship. 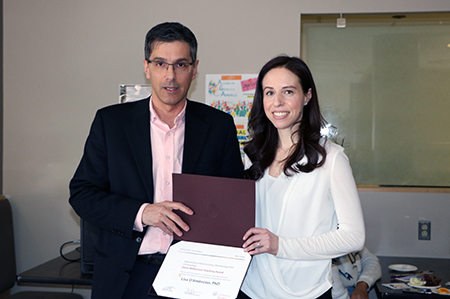 In addition, Dr. Bourgeois-Daigneault has contributed to the success of the Bell lab by supervising and mentoring several trainees. To quote one of her nominators, “Dr. Harper is recognized for her combined productivity, ability to unravel complex systems, technical prowess, capacity for mentoring, and discovery of the redox-UCP3 switch leading to potential new therapeutics”. She has discovered the glutathione control switch for uncoupling proteins UCP2 and UCP3. It has been an enigmatic problem in the field as to why UCP2 and UCP3 do not, under most circumstances, trigger mitochondrial uncoupling. “After a decade of detailed investigation into the structure, function, physiology, and studies of mitochondria, cells, tissues, preclinical animal models & humans, Dr. Harper discovered that the redox state of the cell, specifically, through redox sensitive glutathione, controls the activity of these UCPs. This discovery resolved a decade or more of uncertainty in the field and accelerated our understanding of the role of UCP3 in human health. Without this discovery, we would still be in the dark regarding what appears to be one of the most important control systems in muscle.” Simply put, we in the Dept. of BMI have, in Dr. Harper, an outstanding innovator and an internationally recognized scientific leader. 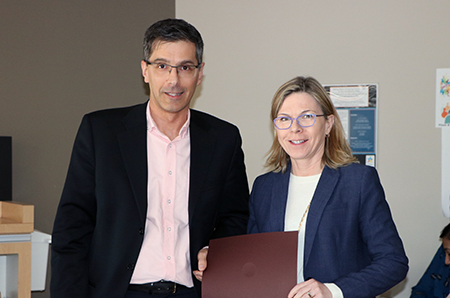 The Denis Williamson Teaching award is named for the one BMI Professor who was awarded the Excellence in Teaching award, the highest educational distinction at the University of Ottawa. This year the awardee is Assistant Professor Lisa D’Ambrosio who in her three years of teaching has demonstrated strong leadership and a clear academic vision in the TMM program. Her courses stand out as being well-crafted, engaging, visually pleasing and each having a specific learning outcome that fits into an over-arching pedagogical plan. The true measure of her success is her absolutely fantastic teaching evaluations in which her courses and teaching are consistently rated the best science course taken by the students. She is also actively engaged in ongoing educational research to assess the effectiveness of her courses and the TMM program. Her commitment to excellence and innovation in teaching reflect the core principles that Denis Williamson brought to his teaching. A well-deserved award!